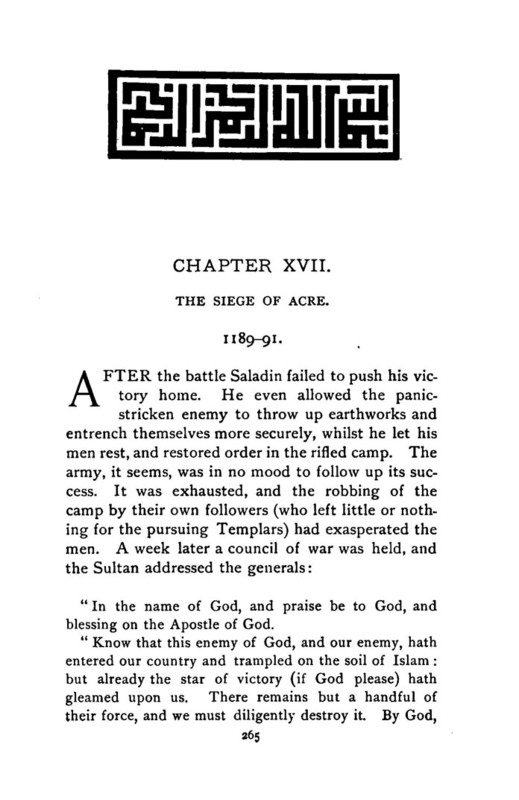 Excerpt from Chapter XVII: “……(T)he French…had put Acre under strict blockade. Saracen ships indeed still forced their way in to the relief of the garrison; one was smuggled in under a French disguise, but generally they had to run the gauntlet. “One such adventure happened in September. Three Egyptian dromonds or ships of burthen opportunely arrived, when there was not enough food in the city to last another day. 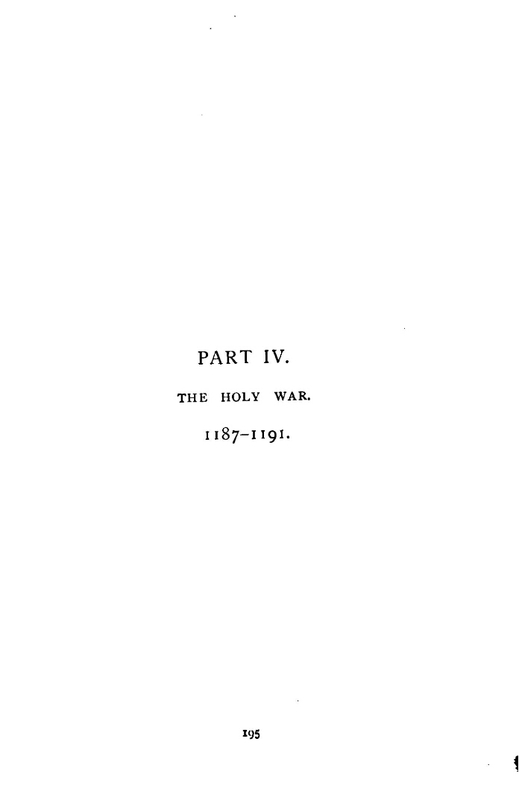 The Christian galleys were upon the new-comers in a moment. 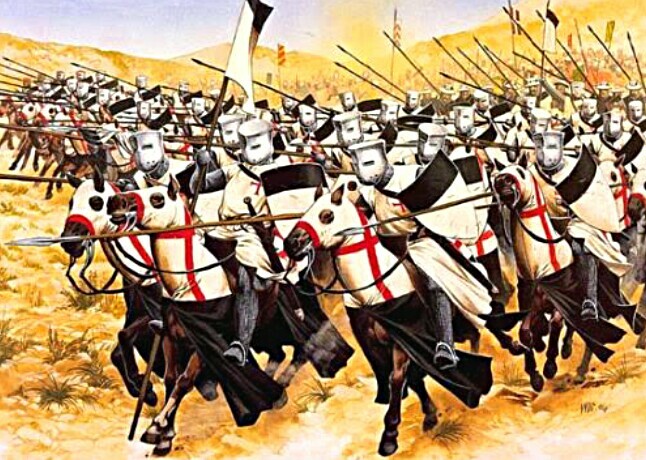 The beach was lined with the Moslem army, calling aloud upon God to save the ships. 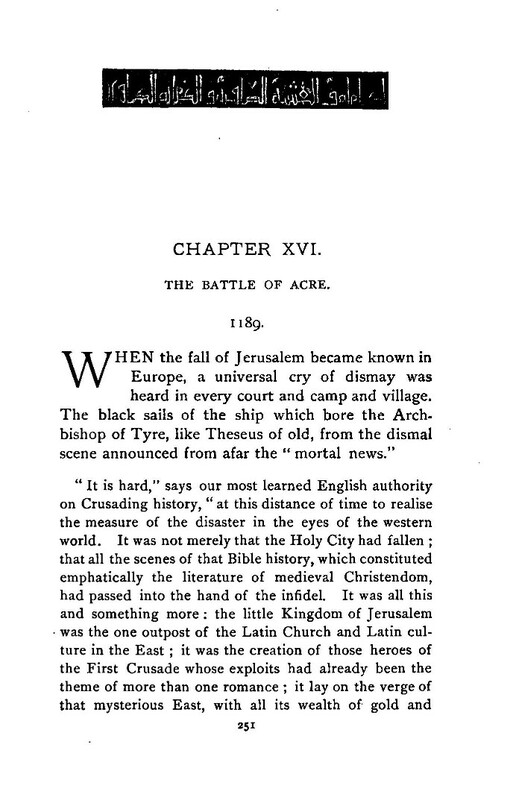 Excerpt from Chapter XVI: “…When the fall of Jerusalem became known in Europe, a universal cry of dismay was heard in every court and camp and village… …To recover what was lost became the passionate desire of each pious knight, the ambition of every adventurer. 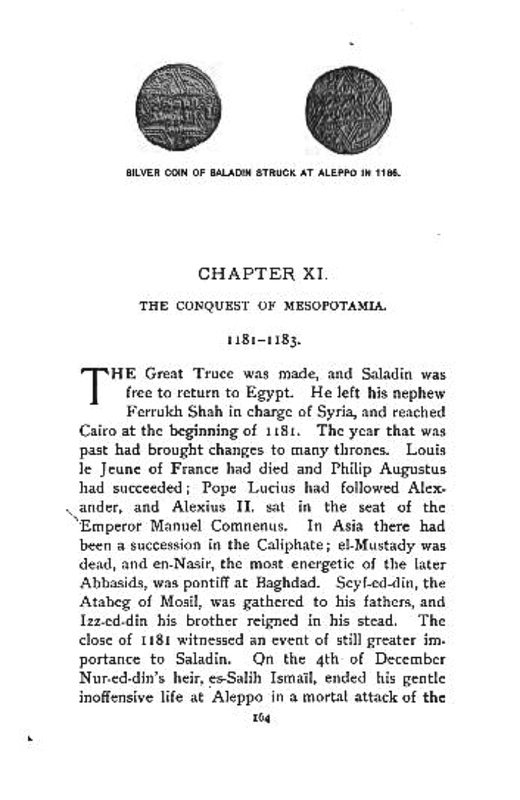 Excerpt from Chapter XV: “… Tyre was the only important place in all Palestine that Saladin had not conquered; and to Tyre he dispatched his jubilant army on 1 November, 1187. Twelve days later he arrived to take command. He found the city full of the garrisons [guards] which he had allowed to capitulate at other places. 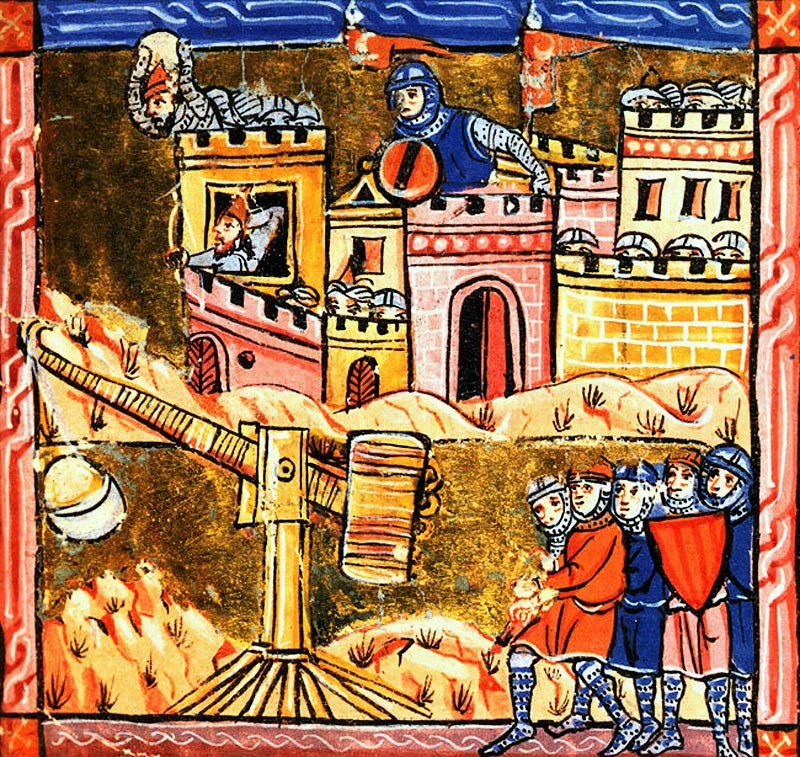 Conrad of Montferrat had worked night and day, strengthening the works, encouraging the defenders, and “directing them with superior ability.” He had deepened and extended the moats until Tyre became “like a hand spread upon the sea, attached only by the wrist,” an island attached by so narrow a spit that it could be easily defended by a small force, as well as covered by the cross-bows of the shielded barges, or “barbotes”. 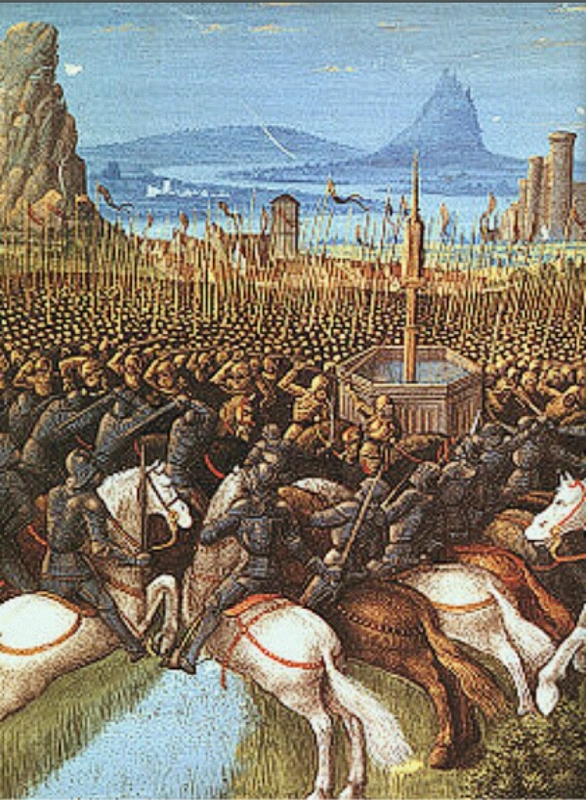 Excerpt from Chapter XIV: “… The articles of capitulation were signed on the 2nd of October (1187), the Feast of St. Leger. 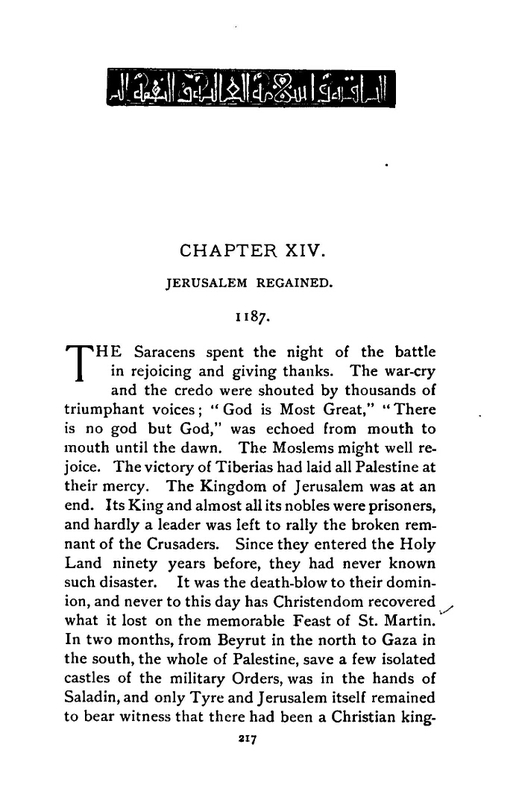 By a strange coincidence, it was the 27th of Rejeb, the anniversary of the blessed Leylat el-Miraj, when the prophet of Islam dreamed his wonderful dream, and visited in his sleep the Holy City which his followers had now recovered after ninety years of Christian occupation. 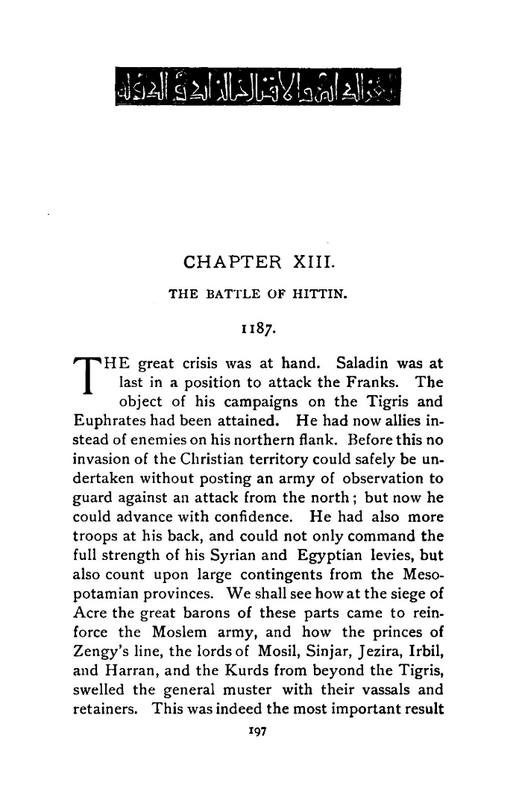 Balian returned to the city and announced the terms. They were accepted, with gratitude and lamentation. The people groaned and wept, and would not be comforted; they kissed the holy walls which they might never see again, and bowing their faces on the ground before the Sepulchre, watered the sacred spot with their tears. 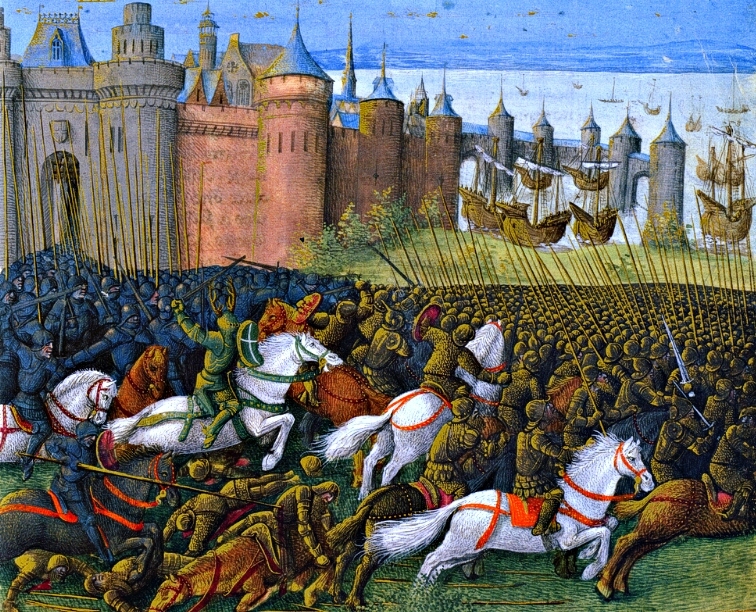 To leave Jerusalem was to tear the hearts out of them. 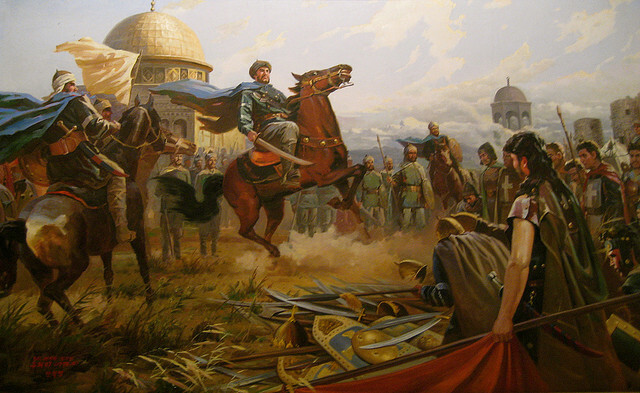 But there was no help for it; the Moslem flag flew overhead, the keys were in the Saracen’s hands, and in forty days the city must be delivered up. 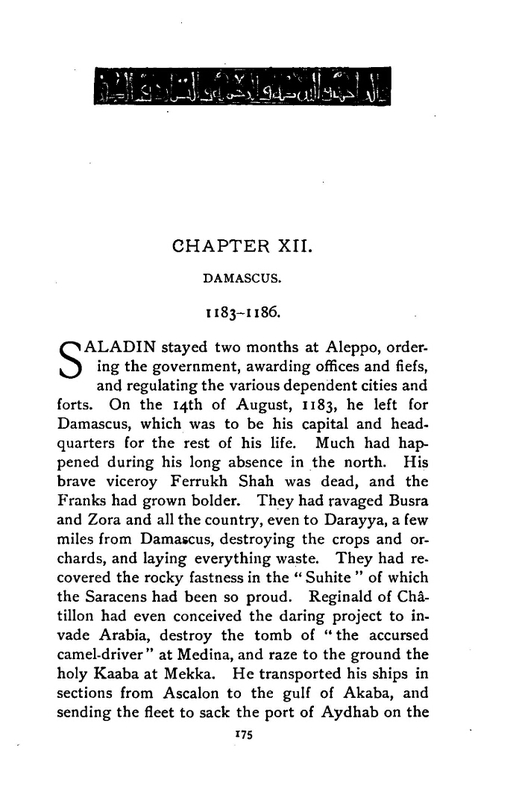 Never did Saladin show himself greater than during this memorable surrender. His guards, commanded by responsible emirs, kept order in every street, and prevented violence and insult, insomuch that no ill-usage of the Christians was ever heard of. Every exit was in his hands, and a trusty lord was set over David’s gate to receive the ransoms as each citizen came forth.